“Identity and Citizenship” by Dr. Mark Lilla, Professor of Humanities, Columbia University. 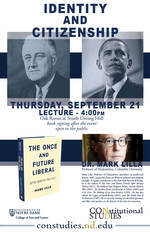 Mark Lilla, Professor of Humanities, specializes in intellectual history, with a particular focus on Western political and religious thought. A regular contributor to the New York Review of Books, he is the author of The Once and Future Liberal: After Identity Politics (2017), The Stillborn God: Religion, Politics, and the Modern West (2007), The Reckless Mind: Intellectuals in Politics (2001),and G.B. Vico: The Making of an Anti-Modern (1993). He has also edited The Legacy of Isaiah Berlin (2001), and The Public Face of Architecture (1987). He is currently writing a book titled Ignorance and Bliss, and another on the history of the idea of conversion.